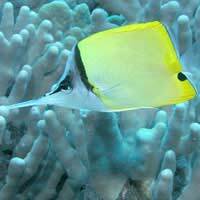 Among the most famous of reef inhabitants are the bold and brilliant butterfly fish. These should not be confused with the African butterfly fish which lives in fresh water and looks very different. Marine butterfly fish are much easier to keep and are popular with aquarium owners everywhere. Still, their highly specific dietary needs mean that they cannot be recommended for the beginner. The dietary needs of butterfly fish are complex and variable. Some will only eat coral polyps and all types need some coral in their diet, so you'll need a well developed reef to support them. Fortunately, most species are solitary or happy to live in mated pairs, so there's no need to struggle to support a shoal. You should expect to have to buy fresh coral on a regular basis to provide proper nutrition for your butterfly fish, especially if you are keeping the more difficult species, so make sure that you can afford this commitment. Butterfly fish need to be fed several times a day. Those which are not exclusively coral eaters require a highly varied diet, but this can include most kinds of aquarium food, including flakes, freeze dried food and live brine shrimp and plankton. There are some commercial preparations available which are specifically designed to provide the right balance of nutrients for butterfly fish. Butterfly fish are particularly vulnerable to parasite infections, so benefit from sharing their environment with cleaner fish. They are generally non-aggressive and easy to keep in a community tank, though they may occasionally nip at other fish. Try to avoid keeping them with other fish of similar appearance. You should make sure that they have plenty of space to swim around and plenty of hiding places. Bluespot Butterfly Fish -These vivid yellow, black and blue fish are among the smaller kinds of butterfly fish. They can rarely be persuaded to eat anything other than coral polyps, so they can be difficult to maintain in captivity. Ocellate Butterfly Fish -These attractive stripy fish like a well planted tank and will eat coral polyps and small invertebrates. Teardrop Butterfly Fish - Comparatively large, these striking fish prefer a varied diet including small invertebrates and algae. Reticulated butterfly fish - These beautiful black and white spotted fish almost exclusively eat coral. Delicate and hard to care for, they should only be taken on by experienced aquarists. Dusky Butterfly Fish -These handsome dark-bodied fish with striking yellow fins are solitary by nature and should be kept alone or in mated pairs. They are among the larger species available. Yellow Longnose Butterfly Fish -These unusually shaped fish are comparatively hardy and are among the easier butterfly fish to maintain in captivity. Butterfly fish are extremely difficult to breed in captivity, though when they're in good health it's not unusual for them to spawn. This involves a vertical courtship dance usually conducted in the part of the aquarium with the strongest currents. Their fry go through a larval stage during which they are very difficult to look after, so very few have been successfully raised to adulthood in home aquariums. Despite the extra effort required to keep them successfully, butterfly fish often become favourites with their owners. They are always active and have complex habits which make them interesting to watch. If you're prepared to take the trouble to make sure they eat properly, and are ready to give them the patience and attention they deserve, they could make a delightful addition to your aquarium.